Ocean Reef Club Key Largo provides what very few resorts can in Key Largo. The feeling that you are coming home. Such is the way that the resort is constructed, you don't feel like you are in a huge franchise complex but instead close the door behind you, and you are in a luxurious world known by very few. The brilliant thing about the resort is although it is vast (it sits on 2,500 secluded tropical acres), it also has an intimacy that is great when you are trying to recharge your batteries and get away from it all. So let’s start with telling you the most important thing about the Ocean Reef Club Key Largo, and that is where it is precisely. And then we will provide details of the amenities, rooms and all the other things you need to do to make sure your vacation can be as perfect as possible. Where is the Ocean Reef Club Key Largo to be found? If you know anything about the Florida Keys, you will know at the very top near the mainland of Florida, is where they all start. And luckily for you, that is also where Key Largo is. 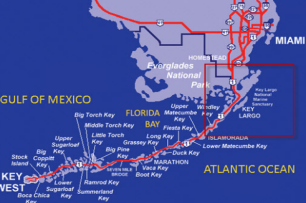 Key Largo is the most northerly of all the islands, and is your first stepping stone down the Overseas Highway, as you move past Islamorada, Marathon, Big Pine all the way down to key West. So as many people do when visiting the Ocean Reef Club Key Largo, they will fly into either Miami International Airport or Fort Lauderdale airport. The other wonderful thing about the resort is that you can also get there by boat, and it has its own runway too!! So to save you reading lots of stuff at the moment that you don’t need, at the moment, for more detailed instructions as to travelling to the resort by anyone of these three methods of transport then click here. The reason that people seek to buy properties at Ocean Reef Club Key Largo, is for the chance to fish, dive, snorkel, dine, swim, all with a great deal of privacy. To be honest once you get within the confines of this gated community you probably won't come out again for ages anyway. You really have everything you want right where you want it. The resort boasts three golf courses, a salon and spa, over a dozen different type of restaurants, a marina that can cater for 175 boats, and as we said before even its own airport. For the kids (Ages 4 - 10) there are a host of activities that will keep them entertained from morning until night, which is great for them and of course Mum and Dad too. So with miniature golf, cooking lessons, night camps, fishing, sailing, kayaking, golf, tennis, games and arts and crafts the parents will hardly see them. And the Ocean Reef Club Key Largo doesn't just provide for the younger kids, as the teens will have plenty of things to do, even from grabbing a golf cart and driving all around the resort unsupervised. So that is the kids off the parents hands, so how about Dad. Well, if he fancies getting a rod in his hand the Ocean Reef Club Key Largo has, surprise surprise, boat charters and experienced sea captains for hire. They can take you out in search of dolphin, blackfin tuna, amberjack, wahoo, shark, marlin, sailfish and kingfish offshore, depending on the time of year. Or perhaps a few tennis lessons by the on resort professionals. Which leaves Dad, with a few hours to stroll around the 36 holes of prime, beautifully looked after golf course, that the Ocean Reef Club Key Largo make sure are in tip top condition all year round. Is There A Choice Of Accommodation At The Resort? There a a few types of accommodation that is available at the resort. And make no mistake the standard of the furnishings and decorations are truly lovely. You can either stay in "The Inn", which is a luxurious lodging, where you will have experienced and devoted staff looking after your every need. But perhaps you you want to look after yourself and be self-sufficient? Then the Ocean Reef Club Key Largo, can provide that too, with many choices from a single bedroom suite to a large ocean view rental house, that will give your family plenty of room to make themselves all at home. What's The Cost Of Staying Here? Now one thing for sure is you need to have a healthy budget to be able to afford to stay at the resort, but you certainly do get what you pay for. From the moment you pass through the gates, you really are living a millionaire's lifestyle. The one problem is, after staying here will you be happy going anywhere else? So how would you make sure that you can stay here? You can rent a property or as many have done, you can purchase your own piece of Key Largo real estate for you and your family to enjoy for years to come.